Oil And Gas Jobs Dubai In ENOC. Dubai is famous for its strong oil and gas industry, and the Emirates National Oil Company (or ENOC Group) is one of the largest players in the energy sector. Entirely owned and operated by the Government of Dubai, this company operates in the fields of production, exploration, refining, operations, supply, fuel retail, terminals, petroleum products and aviation fuel for both industrial and commercial uses. Operating across more than 60 different markets, ENOC has a workforce of almost 10,000 employees and therefore there are many opportunities for those who are looking for oil and gas jobs Dubai in ENOC. There are many different contract types available too including Permanent, open contracts, fixed term contracts and consultancy posts. If you are looking for oil and gas jobs Dubai in ENOC, begin your search on the company's own website. Here, you will discover a dedicated careers portal which has all the information you need about working for this company and how to apply for your chosen position. There is also a job search facility which allows you to adjust the criteria to meet your specific needs, including changing the contract type, the job field, the amount of experience required and whether a driving licence is required. 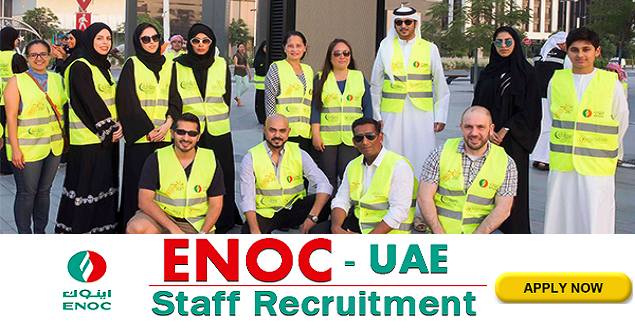 In an attempt to keep the workforce positive and productive, workers at ENOC can enjoy many advantages and benefits. As well as a competitive salary and holiday pay, employees can also take part in number activities arranged by the company to encourage community activities and involvement including social gatherings, health initiatives and programs for families. There is also a corporate wellness program in place with a unit dedicated to promoting employee well being.There are also programs in place to ensure employee suggestions and ideas are taken on board and excellent training opportunities to help workers to progress up their chosen career ladder. If you find a position that you're interested in applying for on the ENOC website, you can apply through the site's dedicated careers portal. When you have selected a post, simply select it and then create your own applicant account by submitting a few personal details and uploading a current resume. You can then submit your application for any job that meets your criteria. Your application will be passed to the recruitment team who will peruse your job application and determine whether you should be invited to interview. Depending on the job that you are applying for, a range of skills and experience may be required. Whereas some posts are entry level, most will require some previous experience in a similar field and will require a degree or industry specific qualifications.